Operators: Gusev S., Sher B., Ryashencev K., Gabalko R., Narunas E., Krichevskiy A., Grinberg YA. Khrushchev's visit to France. Meeting at the airport of Orly members of the French government and French President Charles de Gaulle. Admission Khrushchev, Charles de Gaulle in the presidential residence. Khrushchev lays a wreath at the burial of the patriots of France on the hill of Mont Valérien killed during the Second World War. City of Moscow. Art exhibition dedicated to 90-th anniversary of VI Lenin. Pictures of artists P. Sysoev, V. Serov, NN Zhukov, reading a medal with the image of Lenin's works by the artist A. Sokolov (the chief artist of the Mint in Leningrad). USA. The aircraft carrier Kirsardzh ", sailors who rescued 4 of Soviet soldiers, who have suffered disaster in the Pacific Ocean, in the port city of San Francisco. The rescued soldiers: A. Ziganschin, A. Kryuchkovsky, F. Poplawski, Fedotov at the hotel, on the waterfront, the San Francisco; heroes waving their hands out to sea aircraft carrier Kirsardzh. Ambassador Extraordinary and Plenipotentiary Ambassador of Ghana, John Banks, Elliott presents his credentials to Chairman of the Presidium of the Supreme Soviet Voroshilov. Fishermen trawler "smoke" fish in the Bering Sea in winter. Captain trawler A. Amirbekyan. Fishermen loaded their catch. Greenhouses farm "Greenhouse" Leningrad region of Moscow. An employee harvests cucumbers. Skydiving athletes Vilnius Aeroclub. Lion is taken from the zoo at the age of 7 days, a senior fellow of the Institute of Physiology named after Pavlov VK Shepeleva for the study of innate reflexes in animals, in her Leningrad apartment. Grown-up lion cub is taken to the car to transfer to the zoo. Switzerland. Davos. A monkey riding on the rink on skates. 1. 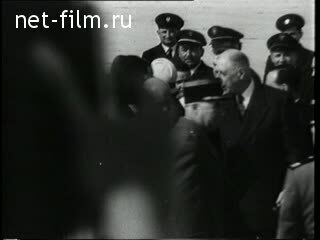 Khrushchev's visit to France. Meeting at the airport of Orly members of the French government and French President Charles de Gaulle. Admission Khrushchev, Charles de Gaulle in the presidential residence. Khrushchev lays a wreath at the burial of the patriots of France on the hill of Mont Valérien killed during the Second World War. Art exhibition dedicated to 90-th anniversary of VI Lenin. Pictures of artists P. Sysoev, V. Serov, NN Zhukov, reading a medal with the image of Lenin's works by the artist A. Sokolov (the chief artist of the Mint in Leningrad). 3. USA. The aircraft carrier Kirsardzh ", sailors who rescued 4 of Soviet soldiers, who have suffered disaster in the Pacific Ocean, in the port city of San Francisco. The rescued soldiers: A. Ziganschin, A. Kryuchkovsky, F. Poplawski, Fedotov at the hotel, on the waterfront of San Francisco; heroes waving their hands out to sea aircraft carrier Kirsardzh. 4. Ambassador Extraordinary and Plenipotentiary Ambassador of Ghana, John Banks, Elliott presents his credentials to Chairman of the Presidium of the Supreme Soviet Voroshilov. 5. Fishermen trawler "smoke" fish in the Bering Sea in winter. 6. Greenhouses farm "Greenhouse" Leningrad region of Moscow. 7. Skydiving athletes Vilnius Aeroclub. 8. Lion is taken from the zoo at the age of 7 days, a senior fellow of the Institute of Physiology named after Pavlov VK Shepeleva for the study of innate reflexes in animals, in her Leningrad apartment. Grown-up lion cub is taken to the car to transfer to the zoo. A monkey riding on the rink on skates.